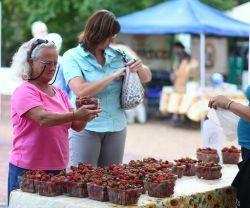 The Nashville Farmers' Market returns to campus Thursday, June 7, 2018 and will be held every Thursday through October 25 with new hours from 1:30-5:00 p.m. The market is located on the medical center plaza outside Langford Auditorium. Stop by and shop for local fruits and vegetables, dairy products such as goat cheese, milk and yogurt, grass-fed beef, free-range chicken, honey, flowers, and more! Local Table: Find out what's in season. Health Plus Health Guide works best with Google Chrome and Firefox.